ORGANOTECHNIE was founded in 1902 and dedicated from the start to the manufacturing of biological products for the pharmaceutical industry. Today, Organotechnie has two main industrial activities. 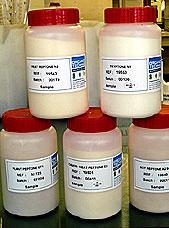 Peptones and Protein Hydrolysates for use in Microbiological Media. Organotechnie started to manuf acture peptones and extracts for industrial microbiology in the 1950's and from 1988 onwards has concentrated its resources on the development of Protein Hydrolysates designed for various applications in biotechnology industries. Organotechnie is a world leading manufacturer of Magnesium Pidolate for use in Drugs and Magnesium Supplementation Preparations. QUALITY The Quality Control Department is present at each step of the production process to ensure that products are manufactured according to the highest quality standards and on a consistent basis.